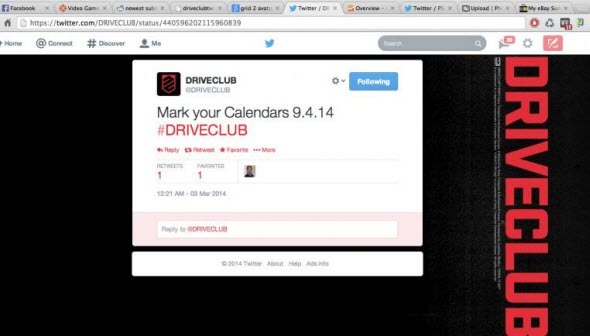 Has Driveclub release date appeared in the network? It seems that today is the day when we get to know the different games’ launch dates. Only in the morning we informed you when The Amazing Spider-Man 2 game will hit the stores, and now we’d like to share the information about Driveclub release. Yesterday, the information about the date when this racing simulator may be launched appeared on the official game’s account in Twitter. According to the message, which was soon removed, Driveclub release date is scheduled for 09/04/14 that by UK standards (and we think so, because the game's developer is a British company Evolution Studios) means that this project will be released on April 9 this year. Although the message was quickly deleted, some people managed to take a screenshot of it, and we are happy to share this picture with you. So far this information remains in the category of rumors, so we advise you to stay with us and wait for its official confirmation from the game’s publisher or developer, which seems to us to follow in the near future. We remind you that Driveclub game will be released on PS4 and promises to offer the players a lot of surprises, more information about which can be got from our previous articles. What do you think about this Driveclub release date? Does it seem to you to be the true one? Your opinions can be left at the bottom of the page.